AKIPRESS.COM - A television channel in Uzbekistan has sparked anger among both viewers and the government after it aired a program that "exposed" public displays of affection among young couples, BBC reported. 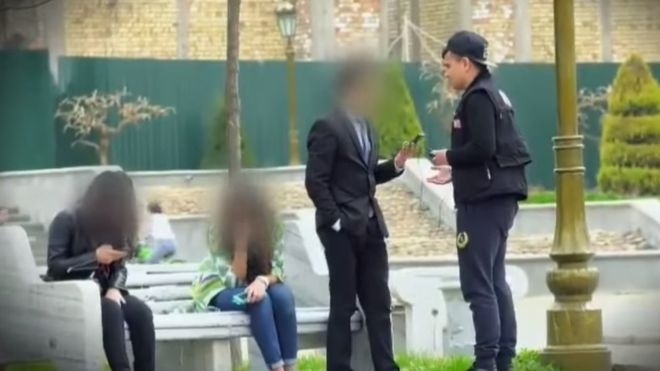 The Yashirin Kamera (Hidden Camera) programme on the MY5 entertainment channel showed several instances of lovers hugging and kissing on benches, their faces blurred, in a central park in the capital Tashkent. The show's presenter tried to interview several of the couples, asking awkward questions such as: "Is this the right thing to do?" Last week's episode led to the channel receiving an official warning from the Uzbek Justice Ministry, which says that Yashirin Kamera "goes against basic human rights and privacy laws", Fergana news agency reports. The notice goes on to call the producers of the programme "unprofessional". Uzbekistan is a Muslim majority country where public displays of love are usually frowned upon as immoral behaviour. But, as one government official told Fergana, "We are building a secular state and a democratic society," adding that kissing in public is not illegal.